Hosted by the Kincardine Yacht Club Provided by Ontario Sailing. 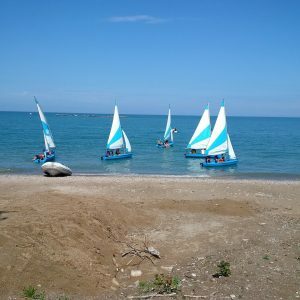 A mobile sailing school with 8 two person sailing dinghies, two inflatable instructor boats, and 2 Canadian Yachting Association certified instructors. Note: Sailing is subject to safe weather conditions. First day meet at the picnic shelter at Dunsmoor Park, on Saugeen Street, between the west (lake) ends of Durham Street and Lambton Street, Kincardine. Bring: lunch, sun screen, lifejacket, or use lifejackets provided. Dress as for swimming. You are going to get wet! Graduation BBQ for all sailors at the Kincardine Lighthouse at approx 15:00 on Friday 12 July 2019.  Be nice to the instructors and have fun! Registration To register contact Mel Smillie at (519) 396-3896 beginning 09:00 on Wednesday 01 May 2019. Leave one message. Registrations will be given to the first 16 juniors and the first 8 adults. You will be contacted after a few days. An OS Participant Registration Form (includes waiver) will be emailed to you, please fill out and sign. Required info includes: Health Card Number, name of doctor, contact names and phone numbers. Please make cheques payable to the Kincardine Yacht Club. Please mail cheque and completed form to Mel Smillie at 606 Scott Street Kincardine ON N2Z 1T7, without delay, to confirm registration.  Cheques will be deposited after sailing begins. The Boat: The vessel used by the South Bruce OPP Detachment is a 32’ (35’ LOA) Wielded Aluminum Patrol Craft built by Hike Metal of Wheatley Ontario in 2002. This particular boat has been dubbed the HH Graham II, and is designated as a launch based on its characteristics. Launches are vessels over 26’ in length and/or have twin engines. The “Graham” has two Volvo D4 Diesel engines producing 260 hp each. Each engine drives a Volvo duo-prop outdrive meaning each drive has 2 contra-rotating propellers, making for a very efficient drive system. The “Graham” also has a 10.5 kw Westerbeke Diesel Generator supplying electrical power for lights, heat and kitchen facilities while out at sea. The “Graham” is equipped with a fridge, stove and microwave as well as a marine head (toilet) allowing the vessel to remain at sea working for extended periods of time, while looking after the needs of the crew. The “Graham” is also equipped with radar, chart-plotter, depth sounder and VHF and Police radios, as well as traditional navigational equipment such as compass, charts and charting instruments and range and bearing tools. The Graham also has powerful mounted and hand-held spot lights and a night vision monocular for searches at night. The Unit: The South Bruce Marine Unit is comprised of OPP officers specially trained in Marine Operations. All OPP vessels are considered commercial vessels therefore crew must be trained to Transport Canada qualifications for the size and type of vessel being operated. There are two levels of Marine Operator within the OPP- Basic Marine operators who undergo a rigorous 2 week training program in vessel handling, seamanship, basic navigation and search and rescue. Successful completion of the Basic Marine course means the officers will be issued with Transport Canada SVOP (Small Vessel Operations) and MED A3 (Marine Emergency Duties- level A3) certificates. This will allow operators to control vessels designated as skiffs- less than 26’ in length with a single engine, and to crew on launches during daylight hours in favorable conditions. To become a Launch Operator, officers must attend another 3 weeks of training including more advanced navigation, seamanship and vessel handling including handling twin engine vessels, search and rescue and vessel maintenance. Successful officers will be issued a Transport Canada Limited Master’s certificate, allowing them to command the launch in all conditions and times. Many South Bruce marine officers have taken the Canadian Coast Guard Auxiliary Search and Rescue course as well as other marine and boating courses on top of their OPP training. The “Graham” requires a minimum of one Launch Operator to command and pilot the vessel and one Basic Operator to crew the vessel during daylight patrol in favorable conditions, and two Launch Operators at night or in adverse conditions or during Search and Rescue operations. Launch Operators are also entrusted to do routine engine and system maintenance of the vessel. The OPP have a full time Marine Mechanic on staff to handle more complex maintenance and repair. The Mission: The mission of all OPP Marine Units is to patrol the designated waterways assigned to the unit; their primary responsibility being enforcement of the Criminal Code and Canada Shipping Act- Small Vessel Regulations. Secondary duties include Search and Rescue and assistance and support to marine activities on or near the water, and other duties as assigned. The South Bruce Marine Unit and the “Graham” are assigned to patrol the waters of Lake Huron from Grand Bend to Tobermory and from the shoreline to the international border. The placement of the “Graham” in Kincardine puts the vessel’s home port approximately half way between its north and south patrol borders. The Canada Shipping Act authorizes Police Officers to stop, board and inspect all Small Vessels (Pleasure Craft) and to demand the assistance of the operators of said craft in completing these inspections. Police are generally looking to ensure that operators of pleasure craft have proof of competency to operate the vessel (Pleasure Craft Operator Card or other proof of competency), that the vessel is properly licensed and, most importantly that all required equipment is on board, readily accessible and in good working order, and that the vessel is being operated in a safe manner. Police may also investigate impaired or “over 80” operation of vessels, and/or violations of the Liquor License Act including having open alcohol on board a vessel without the proper requirements being met, or improperly storing unopened alcohol on a vessel. Police may investigate other criminal offences in which a vessel may be used, such as offences against the Controlled Drugs and Substances Act or other crimes. Police Officers of the OPP are also designated Conservation Officers and may investigate and enforce offences against Ontario’s conservation laws. If you see us in port, please come by and speak with us. We love to answer your questions or provide advice or an inspection of your vessel to ensure you are compliant with current regulations, before heading out on the water.